"Who stole my defense?! Oh, I never had it." I wasn't going to write a post after every single game, but it just so happens the end of the regular season coincides with my vacation. I still haven't decided how I feel about that. Games like tonight help move the needle a little more towards the "depressed" side of the dial, but I can't complain too much since, vacation. This was a game I'm sure most of us were looking forward to watching, for reasons other than it being a baseball game that the Mariners had players participating in. Seattle, being out of the race for quite a while this season, has a chance to play the part of spoiler for the other teams down the stretch. With the Angels fighting for a playoff spot, the Mariners could do their part to keep that from happening. If the Orioles decide to shower and wash away the pixie dust that's been driving them this whole season, three out of the five playoff teams would be out of the AL West. As it stands right this second, after tonight's game, the Angels are 5 behind Texas for the division lead and only 2 behind Oakland for the #2 wild card spot. If the Orioles fall out of it with the A's and Angels taking over the top two spots, they'd play a one game playoff to decide which team advances to the division series. Why should we care? Seattle's not going to be there, so what does it matter? As far as being a Mariner fan, it really doesn't matter too terribly much about who's playing for what. However, this time of year with Seattle out of it, finding something to root for can be a small challenge for any of us for any game. So why not root for the Mariners to beat the Angels into the ground and keep them out of the playoffs? Not out of hate or because they're called the Los Angeles Angels of Anaheim (though that's a pretty good reason), but because playing the spoiler can be fun all on its own. That and because in another lost season where its great seeing rookies develop, watching a game with Miguel Olivo and Chone Figgins in the lineup makes me want to throw things at the TV. Hey Wedge, platoon splits aren't that big of a deal when your team isn't going anywhere and watching young guys play is a good thing. Speaking of Chone Figgins, yes, he was in the lineup tonight against C.J. Wilson because Wilson is left handed and having a right handed hitter against a left handed pitcher is the only way to set a lineup. Actually, the reason Figgins was in the lineup and not Michael Saunders was because Saunders had to leave to team to be with his wife for the birth of their child. That's a great reason to not play Saunders, probably even the best reason, but Figgins, really? 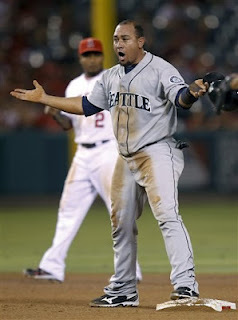 I'd rather see Carlos Peguero go up against Wilson than see Figgins. At least with Peguero there's a chance he might hit the ball 600 feet, whereas Figgins has a chance to hit the ball 60, and I really don't care if he can hit the ball passed the pitcher's mound. Figgins did nothing, which has been the story of his Mariners career. It could be summed up by this one game, except he didn't steal any bases, so forget I typed that. Figgins went 0-2 with a walk and 2 strikeouts, which is about what I figured he'd do before this game even got started. Maybe not that exact line, but for him to do nothing is probably what we all assume whenever he's in the game. That's way more about Mr. Figgins than I had intended on writing, so he won't be mentioned again in this post. I don't think so anyway, since I'm here in paragraph number six and haven't finished it yet. The rest of the lineup didn't do a whole lot in tonight's game either, but they did manage to not get struck out 20 times like they did yesterday. They only struck out 6 times in the course of this 9 inning game, so hey, a positive! Smoak continued his mind boggling September with only one hit, but making that one hit count by driving it over the left field wall in fair territory into the bullpen for a home run. You know, in case you didn't know hitting the ball over the outfield wall in fair territory was a home run. Brendan Ryan added a pair of hits, with one being a double, bringing his average for the month up to .161. I threw that in there because I had it in front of me and I felt the need to share. Thanks kindergarten class when I was a small child! The Mariners started Felix Hernandez tonight in place of somebody else, so that also was a plus. A big plus is the fact we have Felix. We have Felix! Felix wasn't very sharp in the first couple of innings, though he did have 4 K's through the first three innings, he got into trouble in the second. The Angels lead off with a couple of singles, then Scioscia called for a sacrifice bunt. I get that it might be a game where a run or two could be the difference, but really? You're going to bunt in the bottom of the second inning to get a couple of guys into scoring position? Scioscia is either a genius or a moron, but whatever, it's the Angels. Erick Aybar gave the Angels two runs off of Felix to gain the lead 2-0 in the bottom of the second. After a wild pitch and a Trumbo strikeout, Felix walked Ianetta and Trout, but getting Hunter to ground out to finish the inning. The at bat by Chris Ianetta in the second inning was a long one, making Felix throw twelve pitches in that one at bat. Those twelve pitches got his pitch count up and he ended the second having thrown 33 pitches. Felix ended the game having thrown a total of 103 pitches in 6 innings of work, giving up two runs on five hits, two walks and nine strikeouts. That's a pretty good line for any pitcher, but if you had watched Felix in the first couple of innings, his final line would've looked like a misprint. On a side note, Felix struck out Albert Pujols three times before Felix was pulled. Do you know how many times one pitcher has struck Pujols out three times in a game? Zero. It was the first time a pitcher had done it to Pujols. So yeah, there's that too. The M's tied it up in the top half of the third thanks to a pair of walks from Casper Wells and Figgins (there he is again), followed by an RBI single from Brendan Ryan. After Ackley fouled out to the shortstop, Franklin Gutierrez lifted a sacrifice fly to left field, scoring Wells from third and making people happy. Or at least hopeful that they might actually win. Smoak's homer came in the top of the fourth, giving Seattle the lead, more hope, and a scratching of the head because, really Smoak? I mean, I'm glad he's hitting like this, but really, you're going to tease us again in September? The scoring was done until the bottom of the seventh, when Josh Kinney came on in relief of Felix. This is about the time I was on the road and missed the seventh and part of the eighth, so I'm going off of the box score. One thing I can assure you though, Kinney threw 20 pitches in his 2/3 of an inning and a majority of his pitches were sliders. Oh, and he also allowed an RBI single to Hunter to tie the game at 3. I can assure you of that, too. The next eventful thing to happen was in the bottom of the ninth. Not that the Angels scored and the Mariners lost, although they did. I'm talking about one specific pitch in the bottom of the ninth that went for a wild pitch. With Stephen Pryor on the mound and Maicer Izturis on first, Pryor threw a pitch to Miguel Olivo. It was a fastball in the dirt that skipped under Olivo and went to the backstop. It skipped UNDER Olivo. I wrote it twice and I still don't get it. Granted, Pryor throws in the upper 90's most of the time with his fastball and can be difficult to react to, but the thing that irked me about that particular pitch is that instead of dropping to his knees and blocking the pitch so it wouldn't get by, Olivo turned is glove and tried to trap the ball. As a catcher, it's your job to call the game and catch the ball so the runners can't run all around the bases while the ball rattles around behind you. With none out and a runner on first in the bottom of the ninth in a tie game, the catcher the Mariners had behind the plate thought it was a good idea to try and trap the pitch in the dirt rather than getting his body in front of it. I get that Olivo can hit for power and can kinda sorta hit lefties, but when you're hitting .218 on the season with 12 home runs in 303 at bats, you better be a wizard behind the dish. I really don't get why Olivo has played so much this season. Tomorrow is a day game with a start time of 12:35pm Pacific, featuring Hisashi Iwakuma for Seattle and some guy named Dan Haren for the Angels. Will we see the Haren that the Mariners can beat? Will we see the Haren that made the Mariners look like a little league team trying to hit a college pitcher? Only one way to find out! Paying attention to the game, is what I meant. Or you can read about it later. So I guess two ways to find out.